The turpentine collected during the first two or three months is almost colorless and is known as "virgin dip," the best commercial variety. It enters the market as "water white" (W. W.), the next best as "window glass" (W. G.). Less transparent and more colored qualities of resin obtained later or from older turpentine are designated by letters of the alphabet from N to B. 1) 1 Gallon = 3,785 liters. During the second year of operation about 10 bbls. less of dip resin are obtained whereas the amount of scrape increases to 120 bbls. The amount of turpentine oil obtained during the second year amounts to about 40 bbls. of 50 gals, and about 200 bbls. of rosin. As to quality the oil of the second year is fully equal to that of the first, the colophony, however, is mostly somewhat darker. In the third year the amount of "dip" harvested is diminished. With the continued use of the original boxes and the enlargement of the wound from year to year, the oleoresin suffers by prolonged exposure and consequent evaporation. The yield of oil diminishes and the quality of the colophony becomes inferior. The new method may be regarded as a combination of the box system with the method commonly employed in France. 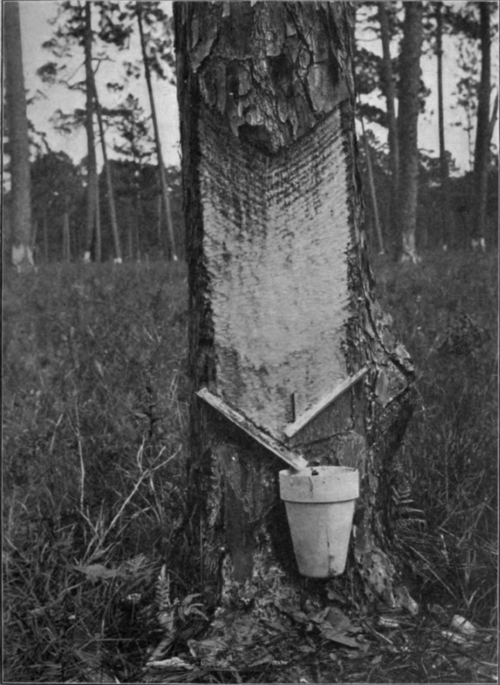 The "box" made by chopping a hole into the tree is replaced by a "cup" fastened to the trunk by means of a nail. As in the box system the bark is removed to the sap wood and the wound increased upward with the advance of the operation. In order to conduct the oleoresin into the earthen cup suspended below (Fig. 6)1) two gutters made of strips of tin about 2 in. wide and from 6 to 12 in. long and bent at right angles, are utilized. These are fastened in incisions made by means of a broad axe in such a manner that each gutter is in a position of 60° to the main axis of the tree trunk. Hence the two form an open angle of 120° when viewed from above. However, the gutters are not of equal height, but one is fastened about 1 to 2 in. higher than the other, so that the turpentine flows from the upper gutter into the lower one and thence into the cup. With the enlargement of the wound upwards, the positions of gutters and cups are also raised. If the trees be thick and rich in oleoresin, several such cups can be fastened on several sides of the trunk. At first the wounds were enlarged by making additional incisions 1 to 11/2 inches deep and 1/4 to 1/2 wide. Later, special axes were constructed whereby strips only 8/8to 7* in. deep and 1/8 to 3/16in. wide were removed, thereby sparing the tree still more. 1) For figures 6 to 8, I am endebted to the Forest Service of the U. S. Department of Agriculture, Washington, D. C.
Fig. 6. Collection of Turpentine (Cup- and Gutter-System). The advantages of the cup and gutter system over the older box method lie in the fact that the trees remaining in the already thinned out pine forests are spared much more. Whereas the old method exhausted a forest in 4 to 5 years, the new method permits the trees to be operated from 15 to 20 years. Even at the end of this period the trees have a greater lumber value because of the lesser damage effected by the surface wounds. The cup and gutter system admits of the tapping of young trees which formerly could not be used. The exhausted trees are less liable to destruction by fire. Whenever the dry grass burned, the readily combustible oleoresin in the boxes was apt to take fire, resulting in the destruction of the entire forest. Wind brakes were another danger, since the boxes weakened the trunks causing them to be blown over by storms. According to the old system, the oleoresin had to traverse a much larger distance before reaching the container, i. e. the box. This distance amounted to 15 inches during the first year, to 30 in. during the second year, to 45 in. during the third and to 60 in., during the fourth year. As a result not only the loss from evaporation increased with each year, but the rosin deteriorated as well, becoming darker each year from prolonged exposure to the air. Whereas the old method yielded but 19 to 20 p. c. of oil upon distillation, the new method yields 22 to 25 p. c.
However, the new method likewise has its disadvantages1). The cups into which the balsam flows are frequently thrown to the ground by pigs and other animals feeding in the forests. Even when carefully handled many of the earthernware cups are broken. Finally, considerable loss of turpentine oil still results from evaporation. All of these disadvantages as well as the loss from fire can be removed, it is claimed, by certain modifications resulting in an air-tight connection between the tap of the tree and collecting vessel. A hole 23/8 in. in diameter and not too deep is bored into the sap wood. From the central axis of this hole two additional cavities, 3/4 in. in diameter, are bored in a direction slanting upward. By smoothing the bark around the central opening a flat cover can be fastened over it. This cover is connected by means of a tube with another cover at right angles to the first. To the latter a glass jar of about1/2 1 capacity can be screwed. The turpentine collects at first in the 3/4 in. bore holes, then in the wider opening and ultimately flows through the tube into the glass jar. One disadvantage, at least in the beginning, lies in the higher cost of the glass jars and metal attachments as compared with the clay pots and strips of tin. 1) Scientific American 105 (1911), 383. The Distillation of Turpentine. As already stated, the distillation of the turpentine on the larger turpentine farms is carried out in large copper stills over direct flame. After the turpentine has been molten in the still, a thin stream of water from the upper part of the condensing vat is passed into the still without interruption to the end of the distillation of each charge. The distillation being ended, the liquid rosin is drawn off from the bottom of the still, strained by means of wire sieves, and filled into barrels for shipment.